Starting my third year as a school administrator, I’m finding that the journey toward school administration mastery is a long one. It seems every day I am learning some new lesson or policy or procedure that reminds me that I’m not as close to my goal as I hoped to be. Sometimes I find myself regretting a decision I made or a poorly-communicated conversation, but I comfort myself with the thought that all my mistakes are learning experiences that will help me move a little closer to where I want to be. 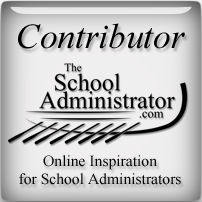 In this post, I want to share 5 lessons that I need to remember to stay on course toward school administration mastery. Be Positive – This is a tough one for me sometimes. Stuff happens that wants to dominate my thoughts, and I find myself wearing my “serious” face. Also, I get teachers or parents who come to me with their complaints, and expect me to join in. I’m learning that I need to be the one who demonstrates the everything-is-going-to-be-OK attitude. My facial expressions must tell people that I am feeling great about what’s going on, and I have to be the one to find the good in every situation. It’s not easy, but I’m getting better at it. Ask for Help – I’m learning that I don’t have all the answers. I can’t do everything. What I have learned, however, is that I am surrounded by amazing, intelligent, talented and hard-working people who want to help. They are just waiting for me to ask them. I have never liked the idea of delegating work that I can do, but in this position, there is just not enough time in the day. “Can I ask you to do me a favor?” is a question I’ve been asking a lot lately. Again, it’s not easy, but I’m getting better at it. Give Praise – We all need a little pat on the back every now and then. 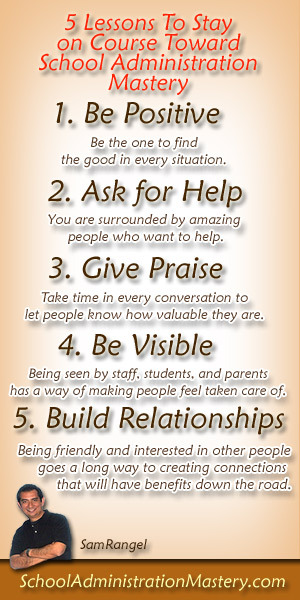 Teachers, custodians, clerical staff, and even other administrators need to hear that they are appreciated. I’m learning that in my position, my words carry more weight than they did when I was a teacher. I’m learning to use my words to build people up. There will be times when I’ll have to offer constructive criticism (if there is such a thing), but there has to be a conscious focus on taking time in every conversation to let people know how valuable they are to the school, the students, and to me. Be Visible – It’s so easy to spend the entire day in my office. I sometimes use my office as sort of a safe haven from those who have demands on my attention. An administrator stuck in his/her office looks like he/she is too busy with school problems to be social – at least that is the perception. Being seen by staff, students, and parents has a way of making people feel taken care of. Does that make sense? Does that mean I have to stay later to get work done? Maybe, but I think the benefits of being more visible are worth it. Build Relationships – One of the greatest lessons I have learned these last two years has been the importance of creating and cultivating relationships. I’ve never been a “hi-my-name-is” kind of guy. I’ve always like to sit in the back of the room and keep to myself. What I’m learning every day is that the most successful administrators are experts in building relationships. Part of it, I know, is political. If I want to move up in my job, I need to know the right people, but I believe that just being friendly and interested in other people goes a long way to creating connections that will have benefits down the road. I know that should I have to have a crucial conversation with someone, it will go a lot easier if we already have some kind of positive relationship. Also, there will be times when I’ll have to ask for help or I’ll need a favor. Being able to call on those people with whom I’ve created a positive relationship will make the request easier. I know there are many more lessons that I need to remember, but I’ll start on doing well in these five before moving on to the rest. P.S. If you Twitter, Tweet This. It would me a lot to me.